Hello again! Dr. Matt here checking in for the end of week 1. It’s been a pretty great week far. Other than on Wednesday, I really didn’t have any problems with cravings, and at no point did I have experience any real hunger. Now, my starting at 330 lbs, I had to modify. I did as many regular push-ups as I could do until I started to fail, and would finish on my knees. I had no problems with squats, just need to work on my depth. Pull-ups are being done with resistance bands right now. Once I get down to 260, I’ll start doing assisted pull-ups. And plank is being done on my hands, and not my forearms. That was Monday’s workout. The rest of the week I tried to get as much walking in as I could over my lunch break, but I didn’t really get another workout in until yesterday (Saturday). I woke up and did a 30 minute DDPYoga Workout. That was it for real exercise, but I will tell you that the rest of my Saturday was spent taking stuff out of storage and moving all day. We cleaned out the back of my dental office getting ready for the remodel that starts tomorrow, and we had to move stuff that looked like it’d been in that building for the last 60 years. It was kind of cool the old-old school dental equipment (I’m surprised it wasn’t belt driven with a foot pedal), but that stuff was HEAVY to move. After my team and I finished with that, then I went to help my folks move stuff out of their storage unit. Which ended up taking 4 truck loads. So yesterday was a VERY active day. Alright, so with all that let’s take a look at where I’m at. Boom! 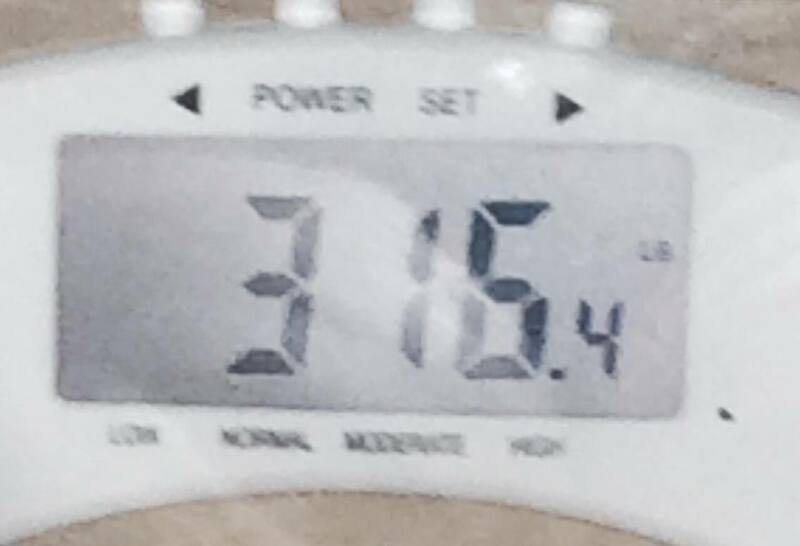 Down over 12 lbs in less than a week. Now let me be clear, a lot of this is water weight. I want to make sure both you and I are fully aware of this. The reason why a lot of folks lose a ton of water weight when beginning primal, LCHF, or keto diets is because of two things: insulin and glycogen. As noted by the American Journal of Physiology , when insulin levels are lowered the kidneys start getting rid of excess sodium from the body. Lower insulin can also help improve blood pressure as also noted in that study. Next up is glycogen. It’s been said that a healthy adult can store around 400 grams of glycogen in the liver, and about 100 grams in the muscle. This is the conventional wisdom, but I’m having trouble locate the actual scientific sources of this, so take it with a grain of salt. But let’s say the conventional wisdom is correct. (Edit: Busted out my Textbook of Medical Physiology by Guyton & Hall 11th edition, and they state that liver cells can store up to 5-8% of their weight in the form of glycogen and muscle cells can store 1-3%. Page 832 of this edition if you want to check it out). So that’s roughly 500 grams of glycogen storage. And each gram of glycogen caries 3 grams of water . So that means if you deplete you glycogen stores, you can be losing 1.5 kg or 3.3 lbs in water weight. So of the 13 lbs I lost this week, was it ALL water weight? Doubtful, but I’m sure it played a part. What will be interesting is from this point forward. Do I have that much more excess water weight to lose? If not, how will it effect the rate at which I lose? Also, I’ll be picking up a blood pressure cuff to use so I can start reporting that as well. Getting closer! Still not quite to a state of nutritional ketosis, but I’m on my way. A normal person can enter nutritional ketosis relatively quickly, 2-4 days usually. Here it’s taken me over a week. That goes to show how insulin resistant I truly am. It also shows how I need to be super diligent. 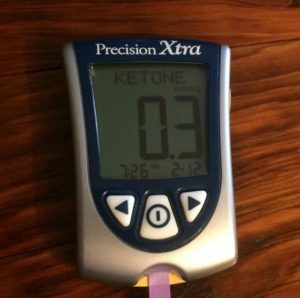 If I were to slip up or have a “cheat”, it could take me a whole week to get back into ketosis! Not worth it. That’s it for week 1! Stay tuned as I’ll chime in mid-week for a quick check in. Next articleKetodontist Podcast- Episode 00- Intro and What is Ketodontist? Looking forward to watching your progress. I’ve been doing research and definitely made some significant changes (intermittent fasting, HFLC) in hopes of eventually taking Keto on full bore. Anyway, I’m curious if you’ve considered using exogenous ketones to help establish ketosis. Dominic Agostino and others have shown it to help dramatically. Even those not following HFLC or Keto can benefit. Happy things are going well for you. Super impressed with your knowledge and commitment. Looking forward to reading more. Baron, Thanks for checking in! I do in fact use exogenous ketones. As stated in my Day 1 post, I use Keto-OS supplements and currently do one a day, alternating between Maui Punch and Orange Dream. That being said, I don’t want to rely on those supplements for to get the therapeutic benefits of nutritional ketosis. Also, I am wondering how long the benefits last after consumption. Yesterday I took a Maui Punch at 5 PM, and by the next morning I’m out of ketosis, so that’s amount of time you’re getting benefit? I think I’m going to do a little experiment on Wednesday. I’ll wake up and do my mid-week ketone check using the monitor. Then I’ll take some Keto-OS and recheck hourly to see how much of a boost I get and how long it lasts. They tell you to check urine, but even this morning I tested both urine and blood. Urine said I was in moderate, where blood said I wasn’t even in a true NK. We’ll see how it goes, and I’ll keep you posted! Congrats on the progress, Matt! I am getting rid of my Sea Salt Caramels and getting on the Keto Trail! I am feeling inspired by your progress and educational blog. Way to go! !